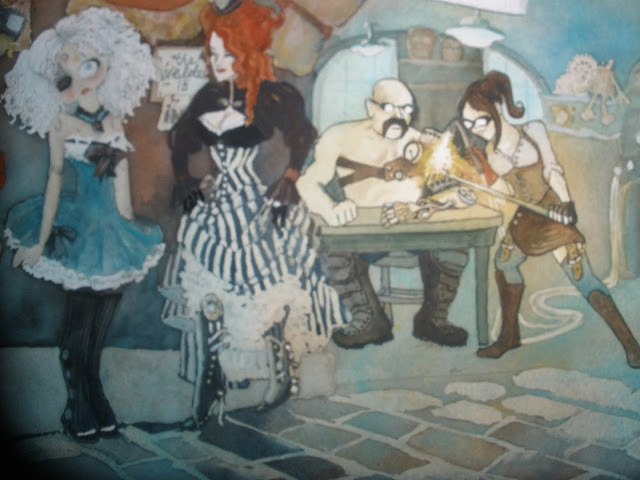 Last week I finally told you about my Steampunk painting. I call it “mine” but it has been a group effort. 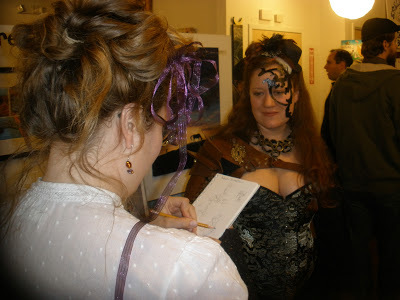 I bounce ideas and names around, I talked to a welder, steampunk friends, google search, pinterest, anyone that might have a different perspective. If I’m lucky I can get artists to critique it. One of my hang-ups on this painting was the lettering. I wanted some giant letters from an old sign to add some abstract decoration to the background and I needed to have an awesome steampunk name for the shop. I decided I wanted to make homage to the Davenport Sisters and their shop, Davenport and Winkleperry. So, in my mind the rest of that large sign would have said “Davenport Sisters”. Originally, I was thinking of calling the welder girl Moxie, a suggestion from a friend but she turned out so cute I didn’t want her to be associated with something cute like “pixie”. Facebook is a great place to problem solve so I posted my question and I had great responses. Another friend said she preferred “Max” for a welder chick and I agree. 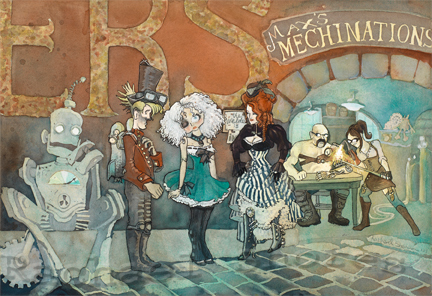 My husband was the brilliance behind “machination”: A crafty scheme or cunning design for the accomplishment of a sinister end” according to the The American Heritage Dictionary. It’s a real word! . . and I spelled it different. My hubby did think it was the old world word for mechanics but I haven’t been able to find evidence of that. I love it’s sinister meaning though. Once the words were in place the painting was ready for color. For this painting I was trying a new technique. Pouring the color in controlled segments. This involves a lot of planning and a lot of masking material. I got this as a present from my relatives, the Allens, and I am so excited about this book. This woman paints watercolor in a batik or egg dyeing style. 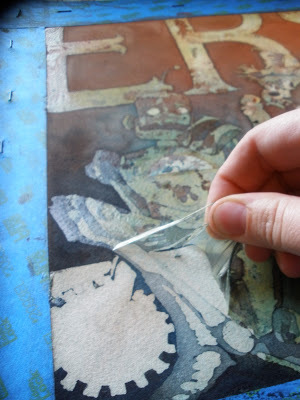 You start with the lighter colors, let them mix on paper, mask the areas that you want to stay light, then pour again. I spent an entire day doing this. I had to wait for the paint to dry, mask, wait for the mask to dry, pour more paint, and then see how the effects worked once it was dry. Here is one of those pours. It’s a little scary. You cover things up, hope you did well, hope you didn’t forget to cover up a light area, and colors get darker and darker. One thing I learned is that I have to work on getting the colors to mix more on paper. I think my layers got rather flat. If you see Jean’s paintings it’s like a sunset is in every shape, it’s amazing. 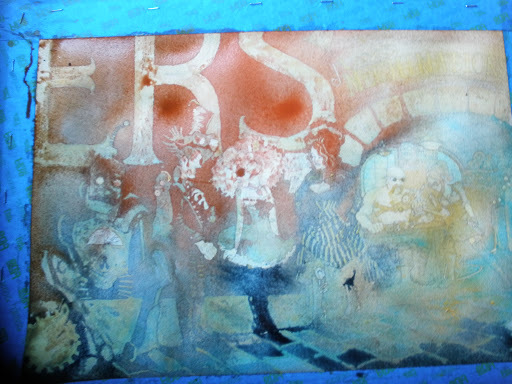 When I was finally satisfied with the darkest colors I began to peel away the masking. Another thing I had to accept is that the masking will lift off much of the pencil. If the pouring worked the way I wanted it to I now had lights and colors to define the shapes and I didn’t have to rely on missing pencil outlines. 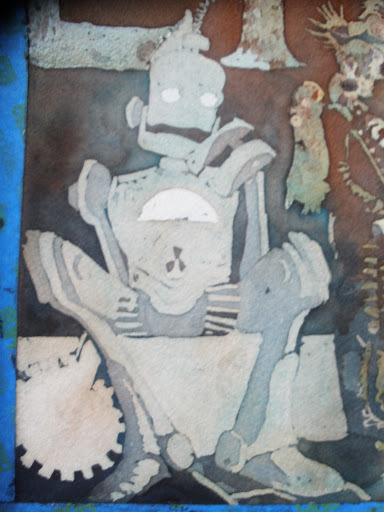 I actually like the rusty look of the robot that all the drops of color created but you can see what color has actually been allowed to get on the paper. I’ll have to work on a more daring rusty look one day. Still, after all the 4 or 5 pours I did I still had to paint in the details. This is how I usually get the color on it but the nice thing is that I had solid background colors to fill in and harmonize the piece. I worry about certain areas becoming too developed or too bright but the base pours left a wonderful mess all over the painting to sort through and bring harmony throughout. Still lots of work to do but I love the basic shading. Such strong contrast. Finally, after one more sleep – after I think I’ve painted every detail – I started the outlining. The figures on the right have been outlined and the figures on the left have not. Can you see the difference? In the early days of illustrating I used to outline every single detail but I love the effects of watercolor and I want to let that shine whenever I can. It’s a fine balance of what looks complete, too worked, or forgotten. I think I achieved what I wanted. A little fuzzy but I think you can get the idea. So now I have a final painting. I had help from one more friend that had given me a picture frame. I didn’t even think of it until I was looking in the closet for something else. The frame was leaning facing the wall and I suddenly remembered it’s black and rusty red stripes, and its gold embelishment. It was a perfect match for this painting. I wasn’t able to take it to my favorite frame shop due to weather but I did get a nice green velvet mat picked out. It really sets off the work. I will try to get a picture of it. I hope you were able to make it to the show. Never mind the glare from the street and gallery lights, check out this great framing job! Red and black trim and olive green velvet mat. So funky. Zapow let me set up show and do personal steampunk illustrations of people at the Steampunk Art Reception, Feb. 9! I sold enough that I had to finish them on Sunday so I could mail them out on Monday! Luckily I had planned for that. 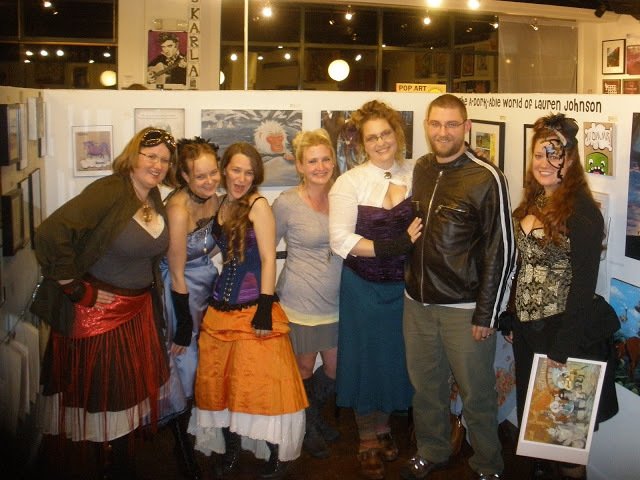 A huge and grateful thanks to all those that came out to support me and have a really great time at the Zapow Steampunk Art Reception and congratulations to Amber who won one of my limited edition prints for Best Dressed, far right. The original is now for sale! 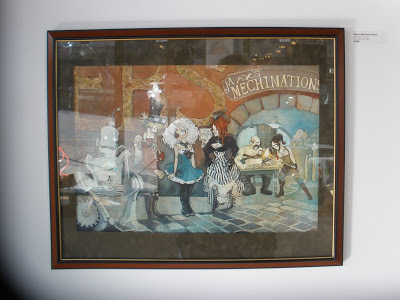 Matted and framed for $490. Contact Zapow for details. Prints are available at Zapow as well as on Esty.